Two articles on the FDL website detail the intimate and incestuous relationship between the Barry Obama administration and Goldman Sachs. FDL names names and provides expansive detail on the Goldie administration. 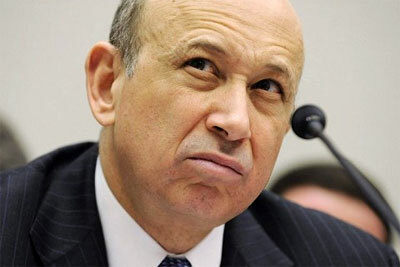 Lloyd Blankfein, Goldman Sachs CEO: the man who may as well be president. Elena Kagan is merely the latest addition, although her ties to Goldman are downplayed if not completely ignored by the corporate media. Goldman had sponsored trusts such as Blue Ridge and Shenandoah, speculative Ponzi schemes that made the market collapse of October 1929 possible. Goldman and others “whip(ped) up a speculative fever in shares, reaping (highly leveraged) capital gains with other people’s money.” They were fraudulent pyramid schemes, a “Charles Ponzi-Bernie Madoff scam,” writes L. Randall Wray. It was not mere greed and short sightedness that created the Great Depression. “To think that the scientifically engineered Crash of ’29 was an accident or the result of stupidity defies all logic. The international bankers who promoted the inflationary policies and pushed the propaganda which pumped up the stock market represented too many generations of accumulated expertise to have blundered into ‘the great depression,'” writes the late Gary Allen. “The international bankers sought to bring about a condition of despair here so that they might emerge as the rulers of us all,” lamented Congressman Louis McFadden, Chairman of the House Banking and Currency Committee at the time. Goldman is now strategically placed in the White House as the Greatest Depression inexplicably unfolds all around us. McFadden was on the right track — the banksters are positioned to emerge as rulers of us all… and most of us, thanks to the corporate media, are completely unaware. Here are the FDL articles: A List of Goldman Sachs People in the Obama Government: Names Attached to the Giant Squid’s Tentacles and An Updated List of Goldman Sachs Ties to the Obama Government Including Elena Kagan.